All of our products use the finest British wool blends and our highly advanced production methods, mean that we can offer some 650+ different carpet options. 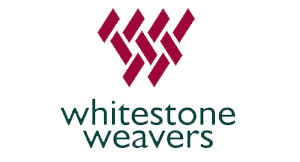 Established in 1991 and originally Middlesborough based, Whitestone Weavers moved their business to Hartlepool in 2007, upscaling technological processes to encompass their increased business capacity. Our Wakefield Carpet company is pleased to offer Whitestone’s extensive range of Axminster and tufted carpets, providing carpeting for both home and commercial sectors. Whitestone manufactures in a combination of the UK and Eastern Europe. Axminster carpets are offered either as 100% British undyed wool or a mix of 80% Wool/20% nylon. Whitestone’s Axminster range is extensive, of which the most well are the more traditional Axminster designs. The Prince Bishop and Cathedral ranges are more traditionally designed with more heritage oriented emblems patterning the carpet, such as Sceptre, Crown and Trellis (Prince Bishop) and Tudor style patterning (Cathedral). Both these ranges are particularly suitable for the more traditional home and public building. The Natural Tones collection is perhaps the most contemporary range, in pastel shades with subtle contemporary patterned fleck return. Whitestone provides a comprehensive range of Tufted carpets either plain textured, or with striking stripy patterned design. Available in wool and synthetic mix as Whitestone’s Hassle free carpet format, or in pure British undyed wool. To suit every taste Whitestone Weavers brings to market over 650 different carpet options – something for every carpet need, whether for the home or commercial environment.